Considering the international success of the hit TV show �Fireball XL5� in the early 1960�s and its built in marketing potential, there were actually very few toys or models produced of the series� star rocket ship. However, one of the first licensed toy products to hit the market was also one of the most unique. Italian toy company, Quercetti had been enjoying remarkable retail success with its line of catapult-launched plastic rockets and missiles based on the real vehicles used in the U.S. space race. Their patented �parachute opening mechanism� invented by Alessandro Quercetti, carried the airborne toy safely to earth after flights that sometimes exceeded 100 meters. When a marketing brochure from A.P. 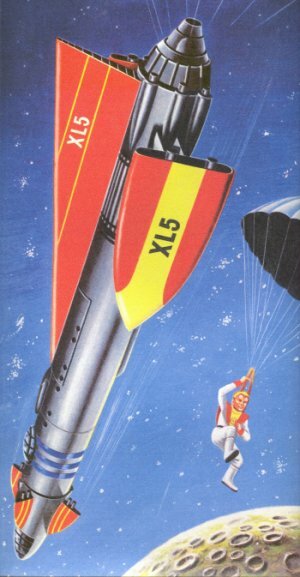 Films (Merchandising) Ltd., promoting the licensing availability of Fireball XL5 was received at Quercetti, it didn�t take much imagination to see how the XL5 spaceship profile could be easily adapted to their existing line of flying rockets. Quercetti�s licensed XL5 toy was marketed in a brightly illustrated box bearing the text: �Fireball XL5 Spaceship with Parachute and Steve Zodiac�. The box measured just over 11 inches tall and contained a fully assembled plastic XL5 spaceship with red & white striped parachute, a small generic figure with parachute (not really an accurate representation of Zodiac), a sturdy orange or burgundy catapult, a water-slide decal sheet and a 2-sided instruction page. Additionally, a �wingless� nosecone was also included for use on windy days and this was interchangeable with the more accurately contoured nosecone. The instruction sheet was profusely illustrated with diagrams to explain the complex steps needed to fold both parachutes and align them properly before closing the upper fuselage hatch. It also detailed the scientific principles in action (Force of gravity & Aerodynamic action), when the rocket was launched and subsequently released the �chutes. This is not surprising, since Quercetti�s innovative founder created a toy company determined to produce �Intelligent Toys� and strongly associated learning with fun. When the XL5 rocket was launched skywards, the aerodynamic force held a �balance arm� close to the underbelly of the rocket�s fuselage. Upon reaching the top of its flight arc, the arm was then free to pivot away from the ship, releasing the upper hatch and ejecting the figure and both parachutes. Steve Zodiac and the XL5 would then slowly descend separately to the ground. While the injection molded Quercetti spaceship generally followed the contour of its actual television counterpart, there were a few modifications to accommodate both manufacturing and aerodynamic requirements. The hollow nosecone, (Fireball Junior) looked very similar to the TV ship but it was made of yellow, pliable plastic � probably to absorb any direct impact or collision and to aid in visually locating the landed rocket by its contrasting color. The main body was composed of 2 shades of harder, gray plastic. The fuselage forward of the tail fin was light gray while the aft section and wings were a more silver gray. The aft wing section was moved back a little and the shield-like stabilizer fins were slightly shortened and did not overhang the wings at the rear. The observation dome atop the main body was a little oversized but surprisingly molded in clear plastic. The decal sheet contained minimal graphics but considering the projectile nature of the toy and its potential for scrapes and hard impact damage, this is not unreasonable. Decals for exposed areas such as the cockpit would have probably been severely worn after the first flight. 3-color graphics (in black, red & yellow combinations), were supplied for the tail, stabilizer fins (Fireball Jr. & main body) as well as the 3 stripes circling the forward section of the main body and �XL5� lettering for Fireball Jr. The Quercetti XL5 toy was successfully distributed in the USA by Straco and in the U.K. by J. Rosenthal (Toys) Ltd. Also, for a short time during 1964, it could be ordered direct by mail order from A.P. Films (Merchandising) Ltd. in Slough, U.K. with the added bonus of a free 35mm film strip which featured 8 black & white scenes from the series. <>As I write this overview, the Quercetti XL5 spaceship is now over 40 years old but still represents a remarkable synthesis of engineering design, educational value and television toy licensing magic that was pioneering for its time. Quercetti is still thriving in the highly competitive toy industry today, producing educational toys for the worldwide market. One of their continuous, best selling items is the �Star Odyssey� Tor Missile - A catapult-launched, parachute toy, based on their original patent, which has sold over 25 million units from its conception in 1960. Bravo! � 2005 by Graeme Walker.